Clacton-on-Sea and the surrounding coastline is part of the Sunshine Coast, an area of sandy beaches and low-level cliffs facing the North Sea. They were considered by the authorities to be convenient spots for foreign invasion and, as a result, mock invasion exercises at Clacton had taken place since the early 1900s. Being close to the sea, many of the inhabitants were heavily involved with yachting and the Royal National Lifeboat Institution, so it's not surprising that a great number joined the Royal or Merchant Navy. Brightlingsea became a major naval port and the Australian and New Zealanders Engineers trained there for four years. 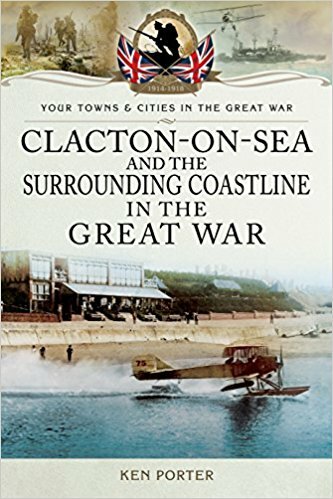 Clacton itself saw over a 1,000 men sign up, and it also had a number of Military and Convalescent Homes that treated injured men. Middlesex Hospital, for one, treated over 9,000 men. The local villages produced a considerable number of men who were awarded the Military Medal/Cross, and Walton on the Naze produced one VC in Herbert Columbine. The tremendous efforts of others are also covered, in particular those of the local women folk. A number of appropriate poems, many written at the time, are included throughout the book, as well as rarely seen photographs and insightful reports from the local papers of that period.